Music is part of the curriculum for students in kindergarten through fifth grade. 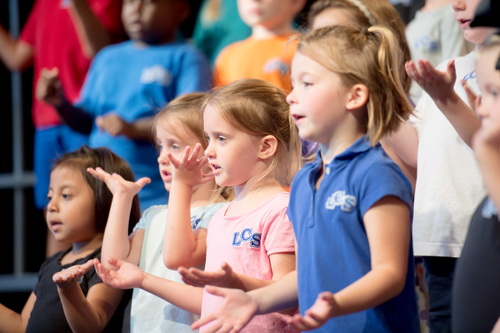 Students participate in group singing, play rhythm instruments, and are exposed to the various instrumental families. They learn about composers and eras of music history as well as listen to great musical works by the musicians studied. Scripture and Biblical truths are taught through the song texts and featured hymns of each quarter. Elementary students also have the opportunity to participate in different performance opportunities. Students in first and second grade perform a musical while students in third through fifth grade participate in the LCS Christmas musical. Fourth and fifth grade students have the opportunity to be a part of the Heart of Joy Chorus and the Choir Chime classes. The chorus participates in the All-County Choir Festival, the ACSI Choral Festival, and performs in chapel and at the Spring Choir Concert.